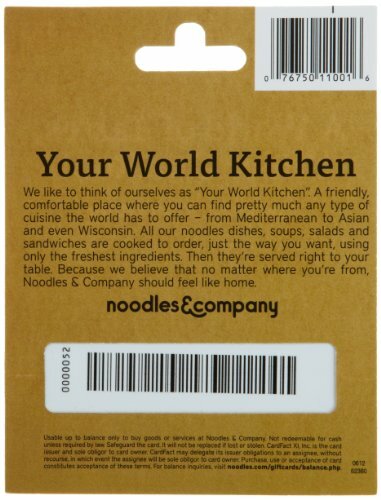 Noodles & Company is Your World Kitchen featuring timeless dishes from near and far. From light & healthy to spicy & savory, they have favorites for all ages. Every dish is freshly prepared with a commitment to only the highest quality of ingredients. We deliver these fresh, made-to-order dishes within minutes to your table. For more information you can always visit noodles.com. As a favorite of many friends this is a giftcard that will be used quickly. 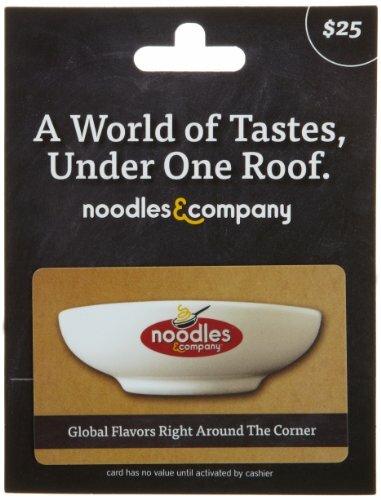 Noodles & Company is Your World Kitchen featuring timeless dishes from near and far. Global flavors right around the corner.